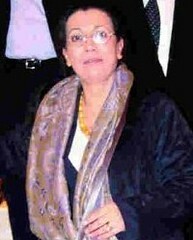 Louisa Hanoune, former Algerian presidential candidate and leader of the Workers Party of Algeria. She has issued a statement on the current political situations in her own country as well as developments in Tunisia and Egypt. In Tunisia, there is battle under way between a minority that defends the old regime, lackey of imperialism, and the supporters of the revolution, which make up the overwhelming majority of the people. Meanwhile in Egypt, the popular uprising that began January 25, 2011, has evolved into a genuine revolutionary process with the emergence of the organized working class, through its sector-wide unions, fighting for its own specific demands. In turn, the quest for a revolutionary solution that breaks with the entire Mubarak regime is posing the contours of a Sovereign Constituent Assembly. In Tunisia, the organizations that are defending the working class and the Tunisian nation, beginning with the UGTT trade union federation, are actively preparing to convene a National Congress in Defense of the Revolution against the backdrop of intense struggles waged by the working class and the youth. In Egypt, however, the revolutionary process is still in search of leadership. And that is why the illusions in the army in Egypt have weighed heavily in the unfolding revolutionary process. The Egyptian army has been the backbone of the Mubarak regime. It is funded by the U.S. government as part of its foreign aid spending. Until February 10, the army was squarely in the camp of Mubarak and supported the dictator's refusal to step down -- in line with the policy directives of the imperialist camp, in which Obama is more and more issuing orders as to what must be done. The army turned its back to the deep aspirations of the Egyptian people, summed up by a protester's sign that read, "Get Out Now Mubarak so that We the People Can Open a New Era and Determine Our Own Destiny." Then -- faced with the unyielding determination of the Egyptian people to oust the dictator, and taking advantage of the calls from the people for the army to join camp of the revolution -- Mubarak announced that he was stepping down from power and was entrusting his succession to the army. It is legitimate for the Egyptian people to unleash their joy at having succeeded in overthrowing a tyrant who, for 30 years, had humiliated them in the interests of a country-selling mafia in the pay of imperialism. But is must also be noted that the coming period, in the aftermath of this momentous event, is laden with uncertainties. And this is because the Mubarak regime is still in place, structured around the very same Egyptian army that acts on behalf of the Zionist entity, through its relationship with U.S. imperialism. It is not surprising, therefore, that among its first public announcements, an army spokesperson stated that the government will continue to respect all regional commitments (Camp David) and international agreements (Structural Adjustment Plans) determined by imperialism. Military rule is contrary to the Egyptian people's yearning for democracy. We must recall that the U.S. government, from the beginning of the popular uprising, had suggested that it might be necessary for the Chief of Staff of the army to replace Mubarak. Having said this, however, we are confident that the Egyptian people -- strong from this first victory -- will find the resources within themselves to regain the initiative and impose their political sovereignty, in which they will define the form and content of the civil institutions that will embody their sovereignty. It is precisely at this very moment when Egypt's fate is at stake -- with its revolution that has shaken the imperialist order -- that sorcerers' apprentices and adventurers of every kind, all friends of imperialism, are becoming mobilized in Algeria, under the cover of the struggle for "democratic change." The February 12 march in Algiers, which has been preceded by delegations of the RCD [the political party led by Said Sadi -- Transl. note] to the U.S. and French embassies and to the European Union to ask them to put pressure on the Algerian regime, brings to mind an attempt to import into our country an "Orange Revolution" -- that is, one concocted and financed by the imperialist powers. Unlike the Egyptian and Tunisian peoples, who have rejected outside interference, the group that has called for demonstrations on February 12 in Algiers looks very much like the March 14 Movement of Saad Hariri in Lebanon, led by U.S. official David Welch, one of the architects of the NME (New Middle East). Clearly, the so-called National Coordination for Democratic Change, a front for the RCD, is trying to manipulate the social discontent, which is real, to divert it in the service of imperialism. This is the case with all movements which, on behalf of imperialism, drape themselves in the mantle of "democratic demands" that are disconnected from the social aspirations of the people and above all from any reference to national sovereignty. It is therefore not surprising that the recent decisions by the Council of Ministers have been characterized as "maneuvers" by the RCD. Though the decisions are no doubt insufficient, they include important measures in the areas of democratic rights, employment, and purchasing power [see the activity report of the Workers Party]. Indeed, national solutions are incompatible with the plans of the RCD. One must know that the president of this formation did not hesitate to beg the U.S. government to do in Algeria what it has done in Afghanistan to establish "democracy" [sic], and also what it has achieved in Iraq, including Saddam's execution. He has gone so far as to compare the Algerian authorities with the Tikritis clan [the family clan of Saddam Hussein --Transl. note]. And it is not a coincidence, either, that all this commotion has begun at the very moment when the IMF has issued its latest report on February 5, in which it calls on the Algerian government to put a halt to wage increases in the public sector and to all government spending. The same report also underscores the fact that "the climate for foreign investment" is not attractive because "of the series of discouraging measures that the government took back in 2008." Everyone can readily understand that this IMF report is targeting the 2009 and 2010 Complementary Finance Acts (LFC) as well as the economic recovery plan that injected 250 billion Algerian Dinars of public funds into investments in industry and agriculture, improvements of wages and pensions, and funding for basic infrastructures. Is it necessary to recall that the RCD voted against all these decisions in Algeria's National Assembly? In addition, one of the "personalities" who has added his name as an endorser of the February 12 march is Ahmed Benbitour, former head of government and consultant for the IMF and World Bank! What is at stake with this whole RCD operation has deep implications for the future of Algeria. But the government's decision to ban the February 12 march in the nation's capital, a decision rooted in the developments going back to 2001, is both incomprehensible and totally anachronistic. Moreover, it is a source of additional confusion and is contrary to the nation's interests, insofar as it exposes Algeria to greater external pressures. That is why, the Central Committee of the Workers Party, which met on January 29-30, reaffirms that "a true democratic change, reclaiming its links with the Algerian Revolution, requires organizing free and democratic elections to a Sovereign Constituent Assembly, composed of accountable and recallable representatives. Such a national constituent assembly must emanate from the people and designate a government responsible to it. Its mandate is to draft a Constitution in accordance with the will of the people, with democracy, and with the aspirations of workers, the youth, peasants, agricultural workers, and retirees -- a Constitution that establishes the separation of powers and the independence of the judicial branch, and that codifies all the attributes of national sovereignty. Such an assembly, strong from the confidence of the people, would have the power to draft a genuine economic reform program that creates real jobs and real wealth, and that provides for the future of the next generation. This, in turn, requires a clean break with the European Union, the repeal of all the concessions made to the World Trade Organization (WTO), and the return to full economic sovereignty -- thus confirming and deepening the gains contained in the 2009 and 2010 LFC legislation and in the public investment program. Such an assembly would have the strength to expropriate all ill-gotten fortunes. This would lay the foundation for a real fight against corruption and mismanagement, for the re-nationalization of the big state complexes and public enterprises that were sold to private capital at a pittance, beginning with the El Hajar complex and with ENGI. It would create the conditions for repealing all anti-national laws resulting from the Structural Adjustment Plan (SAP), the trade agreement with the EU, and the demands of the WTO. It would implement a genuine agrarian reform. The Central Committee of the Workers Party declares that "The restoration of peace must open the way to the advent of true democracy!" - The institutions inherited from the single-party system and from the national tragedy [the civil war that has taken more than 100,000 lives --Transl. note] are done away with, so that the people can speak out again in a way that allows them define for themselves the political reform needed to establish genuine democracy, so that they can choose their true representatives to the elected assemblies in early, free and democratic elections that mark a clear separation between business and politics while upholding respect for the mandate of those who have been entrusted with the people's votes. In this perspective, the Central Committee calls on activists, members and supporters to form Popular Committees with all the signatories of the Open Letter to the President -- bringing together workers, trade unionists and young people -- to establish their demands through free discussion, and to expand the mobilizations that press for solutions to these demands -- all of them exclusively national, Algerian solutions.